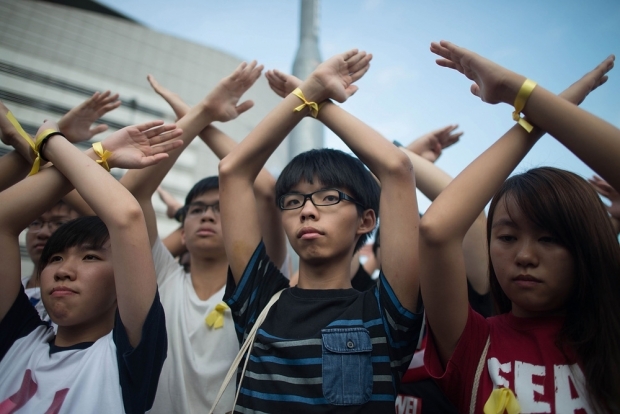 Student pro-democracy group Scholarism convenor Joshua Wong, center, gestures defiantly, together with others, at the Flag Raising Ceremony at Golden Bauhinia Square on October 1, 2014 in Hong Kong. Thousands of pro-democracy supporters continue to occupy the streets surrounding Hong Kong’s Financial district. Lessons in Dissent will be screened at the New American Foundation in New York on November 6, 2014. The screening will be followed by a discussion moderated by La Frances Hui and co-sponsored by ChinaFile. For details and to reserve a free seat, visit New America NYC. To many observers, Hong Kong’s “Umbrella Movement”—thousands of students and other citizens in the streets demanding to choose their own political leaders—seemed to unfurl, fully formed, out of nowhere. Residents of the former colony were supposed to care more about commerce than politics. The heart of the city was supposed to reside in the heights of its sparkling, climate-defying office towers, not in its sweaty streets. And, after 1997, China’s leaders expected Hong Kong’s orderly, industrious residents freed from colonial rule to run ever more joyously into the welcoming arms of their motherland, as the first half of the “One Country, Two Systems” equation inexorably eclipsed the second. That this has not come to pass is less surprising to monitors of the complex and evolving question of Hong Kong people’s identity, which in recent years, and especially among people under the age of 30, has drifted ever further from the path prescribed by Beijing. That drift and the young Hong Kongers who feel its pull most keenly are the subjects of Matthew Torne’s feature documentary Lessons in Dissent, which will make its U.S. debut at the New American Foundation in New York on November 6th. Torne, a British director who has lived in Hong Kong on and off since 2003, spent 18 months beginning in 2012 following two teenage Hong Kong activists. The first, Joshua Wong, (now 18 and among the most recognizable faces of the current protests) is a clean-cut, Christian schoolboy, outraged by a mainland campaign to make Hong Kong’s students more patriotic. The second, Ma Jai, is a long-haired high school drop-out, who becomes active in one of Hong Kong’s most radically pro-democracy political parties. Their very different trajectories demonstrate the extent to which dissent in Hong Kong isn’t limited to a single voice or agenda. Torne gives us not only a rich portrait of these young dissenters in 2012, but an important and revealing lineage for the events taking place in Hong Kong today. La Frances Hui: Why did you make a documentary about Hong Kong’s young political activists, and how did you decide to make Joshua Wong and Ma Wan Kei (aka Ma Jai) your main subjects? Matthew Torne: There is a question that lingers in my mind all the time: What does it mean to be Hong Kong Chinese in post-97 Hong Kong? Before 1997, to be Hong Kong Chinese meant you were from Hong Kong and your ethnicity was Chinese. But now, all of a sudden Chinese takes on both nationality terms and ethnic terms. And what’s interesting about all that is that the Chinese Communist Party’s discourse on patriotism and nationality and what it means to be Chinese is in conflict with what Hong Kongers generally agree on what it means to be a Hong Konger. So the city-level values are in conflict with national-level values and the only way around that is either to become a pro-Beijinger in Hong Kong or to reset the discourse on patriotism. So that was the initial thing which got me interested in it. There’s nothing like it in the world. Londoners are British, European—all those identities fit within each other and are not in conflict with each other. Whereas in Hong Kong, to be both a Hong Konger and Chinese, as defined by the Chinese Communist Party, is a problem. That’s what I set out to make a film on. But, as with all good things, this is not really how it happened. We went around to lots of protests. I hung around activists, tried to find out what they were doing and get to know them. And over a period of time, these were two who stood out to me. What attracted me to [Wong and Ma] was that they both went to the same school. They had the same background, both had a religious background, and they grew up in the same neighborhood. It just seemed like, “Wow, these two are basically coming from the same place, and yet they have taken totally different routes to achieve, really, the same ends. It’s kind of funny in a way that I picked Joshua because he was, at the beginning of the film, super moderate. It was ridiculous. And Ma Jai was ridiculously radical, talking about Molotov cocktails and Trotskyite revolutions. And they just seemed so poles apart. And then over the course of the filming, you see Joshua, he gets more radical—I think he had it in him the whole time—but he allows himself to be [more radical] as he feels he has the public’s backing. And Ma Jai realizes that there is no public backing for some of his earlier ideas—he was only 16 or 17—and he sort of moderates his ideas and changes them. I’m interested in the parents of the two subjects. We don’t see Ma Jai’s family at all in the film, but we see Joshua’s parents, who, whether or not they support his activism, let him do whatever he wants to do. This is quite unlike most Chinese parents, who normally think “education first.” Can you talk about that? Yeah. Joshua’s parents are Lutheran Christians, so in one way they’re quite strict. But by most Hong Kong parents’ standards, they’re pretty liberal. Probably similar to my own parents. His mother’s favorite phrase was, “We’re low-key, low-key.” Meaning that once they held those [liberal] views, and they were supportive of democrats, but weren’t necessarily going out and protesting. His mother would say to me, “Oh, I have to look after Joshua’s younger brother and so we can’t go out and do these things.” And she would say that she didn’t encourage him. I don’t think she would have encouraged him to go out protesting, but his parents definitely encouraged him to read books, to educate himself about politics. -When you start talking to them, it doesn’t take long and you end up talking about June 4, 1989. They had just come out of Hong Kong University, they’d just graduated. There’s a thing in Hong Kong where you get photos taken the month before your wedding. And they got those photos on June 3, 1989. And in the end their wedding was completely overshadowed by Tiananmen Square. And that was such a massive scar, and they talk about how they were watching TV and just bawling their eyes out, because they regarded it as a national catastrophe. So it didn’t take long for Joshua to grow up and to be exposed to and talking about this. He’s also a very mature kid. Ma Jai’s [parents], on the other hand, they’d just broken up about a month before the filming. So they weren’t so keen to participate in the film. You see Ma Jai sleeping in the office of the League of Social Democrats. I tried to include that because when his parents broke up and he was only 15, 16, he ended up going to the League of Social Democrats. Because when you knock on the League of Social Democrats’ door, their politics are such that you can’t help but get a warm welcome. You just say something like, “Oh, I want to help,” and they say: “Great. Come on in.” They let him sleep in the office. They fed him. The older ones regularly put a hand in their pocket to feed not just Ma Jai, but a lot of the younger kids that come through their doors. They look after these kids. What’s really interesting to see in your film and also on the streets of Hong Kong today is how young the protesters are. In your film, Joshua mentions that he cofounded Scholarism because the Hong Kong Professional Teachers’ Union and major political parties weren’t making enough noise to oppose the Moral and National Education curriculum. If you look at the current Occupy Hong Kong movement, the protesters are mainly very young people—many college-aged, some even younger. Do you think this generation has very different political views from the older generations? Do they think the older generations have let them down? Yes. I think the older generation—even now, with Occupy Central—is in intergenerational war with the young. They’re all pro-democracy, but the way they go about doing things is different. I think one of the things that happened at the end of National Education is that, in the negotiations that went on with the government, there was a disagreement between what the older generation thought was acceptable and what the younger generation thought was acceptable. The key thing to remember about the younger generation is that many of their parents were refugees from China and they came to Hong Kong penniless and grew up in squatter villages or public housing, working incredibly hard and going to university. And they were very lucky: there was a boom in social mobility and the economy. They went from a childhood of what most people would classify as poverty to living in a nice apartment block with a Mercedes and a domestic help worker. And that’s a lot to lose if you’re going to go out and fight for democracy now. And with the kids, it’s not like that. -They don’t have anything to lose because social mobility has closed down, and they don’t have any hope. In the U.K., we complain that housing is expensive; but in Hong Kong, it’s just insane. The average price for a house is eleven times the average salary [some sources list housing prices as up to 14 times the average household income]. There’s another key thing, which is that the older democratic party—Martin Lee, Anson Chan—couch their arguments about the need for democracy in terms of resisting authoritarian changes and losing their rights and freedoms, law and speech—all things that I completely agree with. The only thing is, most of the time, the way Hong Kong is set up—talking about the rule of law, unless you’ve got a political science degree, these things are not concepts that are easy to understand. It’s fine for someone like Martin Lee, who is a very accomplished barrister, to be talking about it—but it doesn’t resonate with the man on the street in an impoverished neighborhood like Kwun Tong or Sham Shui Po. They want to talk about: Why is the rent so expensive that I’m living in a cage? Why is it they can barely afford dinner? Tycoons are living in half billion HK dollar apartments. That’s what [Hong Kong’s Chief Executive] C.Y. Leung is. He’s one of those tycoons. There’s a difference between the older generation that wants to preserve the rights and freedoms that they had when the British left in 1997, but they essentially don’t want to change the economic system because they’re already tied into benefitting from it. Whereas the younger generation may see democracy as a way of having a more socially equitable society—and maybe a society where they feel like they have something of a chance. They have no chance as it stands. Because even if you study really, really hard, and study at the best university, and come out, and get a good job, you’ll still struggle to make ends meet, because things are just so insanely expensive. I want to talk a little bit about the idea of a distinct Hong Kong identity. At the core of the protests both two years ago and now is this Hong Kong identity which sets itself apart from the larger Chinese identity. This Hong Kong identity is not something entirely new. We saw the emergence of this in the 1960s and ’70s during social and student movements and the rise of Cantonese cinema. We saw it in the ’80s when the Joint Declaration determined the return of Hong Kong to China. We saw it manifested in the mo lei tau “nonsense” culture, which is most notably embodied in the cinema of Stephen Chow. The latest evolution of this Hong Kong identity is closely related to the experiences of life after the handover. So it has been developing for decades and yet we see the current young generation far more radical than previous generations. Do you think they can’t identify with the larger China at all? I don’t know. I don’t say that they can’t identify with larger China at all. I think there are lots of people with different views. But having interviewed Joshua many, many times, I certainly wouldn’t say how he feels. I think he feels that he is Chinese and proud to be Chinese. He’s proud of his country’s culture, but not necessarily the things that the Communist Party wants him to be proud of. I think his view is that the country could be a million times better if the Communist Party weren’t ruling in the way that they are. The Scholarism Movement is very middle-class. They’re not all middle-class, in terms of wealth; but in terms of their abilities, they’re very middle-class. These are kids who come from families whose parents are educated, and they are now educated; and they have access to the media. These are the reasons why they’ve become more radical. And they’re incredibly knowledgeable about the world around them. They’ve been abroad. They have family holidays abroad—they’ve been to Europe and they’ve been to the U.S., and they ask themselves, “‘Hold on a second. Why have we not got that back at home?”’ These are reasons why this generation is different from the previous generation. Most people, when they came from China to Hong Kong, it was just a stopgap; it was a place to stay [in the] interim, a place to stay before they went back to China, or went someplace else: America, Canada, Australia, or Europe. I went to a talk with Anson Chan and she came from China to Hong Kong when she was eight years old and her parents fully expected to go back to the mainland once the turmoil of 1949 had subsided. But the mentality had always been that Hong Kong was never necessarily home, in that respect. It was just a temporary residence. And I think that mentality—even if you stay there the rest of your life, which is what Anson Chan has done—there’s this mentality where these kids—most of their parents were born in Hong Kong, so they’re second generation Hong Kongers—feel like they don’t know anything else. And they’re not interested in really knowing anything else. They’re not thinking of Hong Kong as some stopgap, some temporary residence. How dangerous do you think this identity is for Beijing? Obviously, if Beijing makes a concession now, it shows that protests work. It’s only a problem for Beijing because Beijing is so intolerant of anyone’s ideas but their own. I think if Beijing was willing to be much more tolerant about Hong Kong identity, then you’d actually find the people saying, “Well, I’m a Hong Konger and I’m Chinese.” And this whole thing where people say, “I’m a Hong Konger, but I’m not Chinese” would dissipate. At the end of the day, it goes back to the idea that the CCP never really understood Hong Kong. You saw this back in 1982 with Deng Xiaoping. The Hong Kong government wanted to send Hong Kong representatives to negotiate alongside the British and the Chinese for the Joint Declaration. And Deng Xiaoping said, “No, I speak for all Chinese.” What it showed was a complete failure to understand that Hong Kong has been separate from the mainland for 156 years, and a separate culture has developed. Where do you think the current Occupy movement is going? I think that’s the problem. You’ve seen that the leaders don’t know where it’s going. I was just reading an interview with one of the student leaders, and he said, “We don’t really know what to do next.” They completely lack strategy. The students seem to be saying, “Oh, we want Beijing to remove this framework they set down on August 31.” And Beijing’s saying, “No way, we’re not doing that.” And I can’t see that Beijing is going to, because they actively said they weren’t. What else do you want to say about this film? The only thing I’d say is that while all the focus has been on Joshua—and obviously what he’s done is tremendous; he’s on the front cover of Time magazine this week—Ma Jai is representative of so many people in Hong Kong, so many activists who are doing their bit. Nobody could accuse Ma Jai of being a lazy kid and not doing any work. He is working seven days a week, at all hours, doing all the jobs that aren’t glamorous, that aren’t fun, that don’t get you on the front cover of Time magazine, but that are absolutely necessary. You have to have people like that. Not everyone can be a Joshua Wong. I am trying to make ready a book and a DVD. It’s a major task. There will be a section of extended interviews and deleted scenes. They couldn’t be put in the film because they broke the flow or went off on a tangent. So I’m compiling that and I’m also preparing for the second film. When we were showing the film in Hong Kong, we had a lot of Q&As after the screening and everyone said, “We need another movie about Occupy Central.” I was a little bit reluctant at first. I thought, maybe I’ll try something else. But I think, in the end, it seemed that this was really the right thing to do.